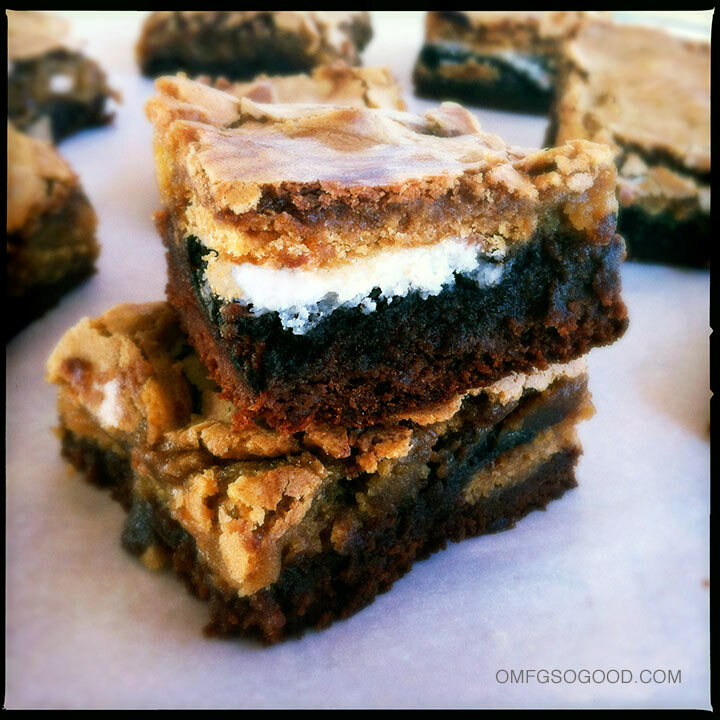 black and white brownies (with oreos) | omfg. so good. Last week Finley and I made a pit-stop at a local bakery, where he four-year-old-kid-style begged me for a frosted black and white cookie. The thing was gigantic. Literally, as round as his noggin. It was also $6. So no, I did not buy him that cookie. The Black and White Brownie (with Oreos). Blondie to the North. Fudgie Brownie to the South. Heads or Tails Double Stuff Oreo in neutral territory. My little buddy and I baked and bonded over delicious bar cookies. And like a good mom, I taught him the important life lesson that the key to eating a black and white brownie is you want to get some black and some white in each bite. Nothing mixes better than vanilla and chocolate. And yet, still, somehow racial harmony eludes us. If people would only look to this brownie. All our problems would be solved. Once again, I find myself relating all too well to an episode of Seinfeld. 🙂Seriously though, these are probably the best bar cookies I’ve ever eaten. The texture of the Blondie is spot-on, with a rich, buttery flavor. 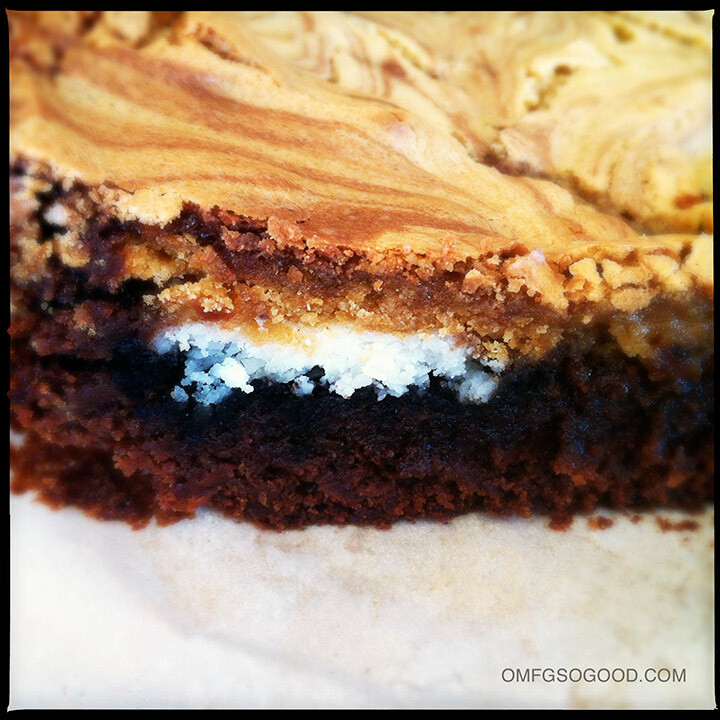 The Brownies are perfectly fudgy, and the half n’ half Oreo adds a wee bit of crunch. Don’t even get me started on the Double-Stuff creme filling. Wow. Preheat oven to 325 degrees. Spray an 8 x 8″ baking dish then line it with parchment paper, leaving some hanging off the sides for easy removal of the brownies. In a glass bowl, melt the chocolate and butter in the microwave for 30 seconds then stir to melt completely. Add the brown and white sugars and whisk until smooth. Add in the eggs, one at a time, stirring to combine completely. Add in the flour and salt and stir until just combined. Pour into the prepared pan and spread to smooth with a spatula. Arrange the Oreos (chocolate side down) in even rows on top of the uncooked brownie batter. Set aside. In another glass bowl, melt the butter in the microwave for 30 seconds. Add the brown sugar and whisk until smooth, breaking up any large clumps of sugar. Whisk in the egg and vanilla. Add the flour and baking powder and stir until just combined. Bake in the preheated oven for 40 – 45 minutes. Cool completely on a wire rack before removing from the pan and/or cutting. It’s going to be tough, but trust me. You don’t want them to fall apart, do you? Remember, people… Look to the brownie.